Looking for deals in Manila? Lub d Philippines Makati is located in Manila, 1969 feet from Century City Mall and 0.7 mi from Power Plant Mall, featuring a 24-hour front desk and a bar on site. Excellent!!! The dorm beds have much more spaces than those in other normal dorm. Their restroom is fully equiped and super clean. The staffs are really helpful, I checked in 4hours before 12 and they still let me in without any extra charges. The location is super convenient with the Century mall, Watson store and many restaurants in walking distance. This hostel is the best thing I have experienced in my trip to Manila. In the heart of Manila, the Marco Polo Ortigas Manila features luxurious rooms with spectacular views. Featuring 3 dining options, this 5-star hotel also has an indoor pool and free Wi-Fi access. Much to love about Marco Polo. Beautiful hotel and rooms that are maintained, luxurious, clean/spotless, rooms included everything that you would need and want on vacation, friendly, helpful and professional staff, a concierge that lives up to what you would expect, classy cafe and restaurants, offered free shuttle services to six popular shopping malls, first class amenities to include: a spa, gym, sauna, locker rooms, indoor heated pool and jacuzzi. Exclusive elevators to hotel guests, nightly entertainment at the top floor giving you panoramic views of the Manila. Immediately outside of Marco Polo, the environment gives you a metro vibe. Walking distances to several restaurants that can appease changing palates, shopping and entertainment. I give my highest recommendations to Marco Polo. Set in Manila within the central business district of Makati, 0.6 mi from Glorietta and 0.8 mi from Greenbelt Mall, The Peninsula Manila features of an outdoor swimming pool, 8 dining options, and a... Great place to invite friends for breakfast , lunch , and dinner. 24 hr late meals at the lobby. Located in Manila, Citadines Bay City Manila offers 4-star accommodations with a fitness center. With free WiFi, this 4-star hotel offers a 24-hour front desk. The staff was amazing - so friendly !!!! and well trained. In the heart of Makati central business district, Raffles Makati features an outdoor swimming pool, a gym and business center. Fantastic nothing negative to say, we will be back. 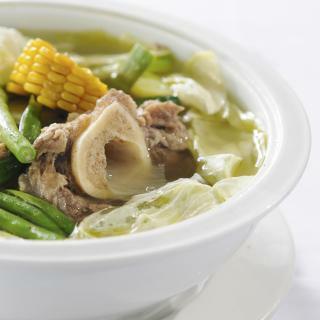 Set 1 mi from Glorietta Mall and 1.1 mi from Greenbelt, The Hotel at Green Sun welcomes guests with a private restaurant, free WiFi access throughout the property, and a 24-hour front desk. Very clean and efficient hotel conveniently located in Makati and close to the airport. Boasting an outdoor pool and complimentary WiFi access, City Garden Grand Hotel offers luxurious accommodations with sweeping views of the Manila landscape. The location is good and it only takes me fifteen minutes to go to Ayala metro Station by foot. Located 6-minute drive from World Trade Center and 7-minute drive from SM Mall of Asia, Red Planet Aseana, Manila features of an in-house cafe, a business center, and free WiFi in all areas of the... Great Location close to the airport and Mall of Asia. Great for a stop over. Comfy clean rooms. Located in the Quezon City district of Manila, Upper Story Serviced Apartments provides rooms with free WiFi. The property features an outdoor swimming pool, as well as a fitness center. It was just 10 mins away from my home so the location is very convenient for us. Located in the Makati district in Manila, 2297 feet from Power Plant Mall, I'M Hotel features a spa center and hot tub. Location. Stuff welcoming guests. Swimming pool is fantastic. View is wonderful. Located at the heart of Resorts World Manila, Belmont Hotel Manila is a 5-minute walk from Ninoy Aquino International Airport (NAIA) Terminal 3 via Runway Manila. Location is perfect for an overnight in Manila. Set within the city of Makati, 1.7 mi from Greenbelt Mall and 1.9 mi from Glorietta Mall, Red Planet Amorsolo offers simple yet modern accommodations with free WiFi access throughout the property. The hotel is clean and new and looks well-maintined. Offering air-conditioned rooms in the Ermita district of Manila, The Luneta Hotel is an 11-minute walk from Rizal Park. Among the various facilities are a garden, a shared lounge, as well as a bar. it was a very romantic hotel very clean the staff was very friendly. Located in Manila, Rizal Park Hotel features a restaurant and free WiFi. Free private parking is available on site. Rooms come with a flat-screen TV. I have no words for the experience.. It was too good.. the room..the ambience..
Manila Hotel is a beautiful 5-star hotel in Manila less than half a mile from iconic Intramuros and half a mile from Manila Cathedral. This was a class hotel.all the staff friendly and helpful. Winford Hotel and Casino offers accommodations in Manila. Free WiFi access is available and free private parking is provided on site. the rooms have magnificent view. Courteous staff. Safe environment. Excellent housekeeping!! Located in the Quezon City district of Manila, ZEN Rooms San Juan Quezon has rooms with free WiFi. Featuring a 24-hour front desk, this property also provides guests with a restaurant. Loved the room and the professionalism of the staff. Great location too. 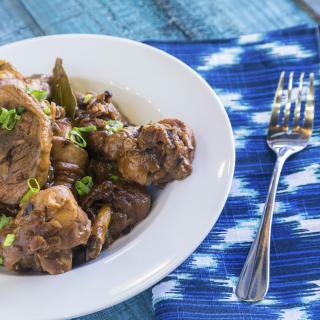 Located within the historic walled city of Intramuros, The Bayleaf is a 5-minute walk from SM Manila and 1 mi from Fort Santiago. I love the ambiance as soon as you enter the lobby.. the rooms are great! Located in Manila, 5-minute walk from Manila City’s Rizal Park and 15-minute drive from the historical Intramuros, Casa Bocobo Hotel houses a café and a business center. The staff are so accommodating and everybody wore a smiling face anytime. The hotel was quiet. What are the best hotels in Manila near Ninoy Aquino International Airport? Travelers who stayed in Manila near Ninoy Aquino International Airport (MNL) have said good things about RedDoorz @ Moonwalk Paranaque, Isabelle Royale Paranaque, and Go Hotels Manila Airport Road. Which hotels in Manila are good for couples? These hotels in Manila are highly rated by couples: OYO 118 Hotel Merlo, Raffles Makati, and Citadines Bay City Manila. Which hotels are the best ones to stay at in Manila? Lub d Philippines Makati, Discovery Primea, and Fairmont Makati are some of the popular hotels in Manila. Which hotels in Manila offer an especially good breakfast? For hotels in Manila that serve highly-rated breakfasts, try Upper Story Serviced Apartments, Shangri-La at the Fort, Manila, and Raffles Makati. How much does it cost to stay in a hotel in Manila? On average, 3-star hotels in Manila cost $45 per night, and 4-star hotels in Manila are $90 per night. If you're looking for something really special, a 5-star hotel in Manila can be found for $161 per night, on average (based on Booking.com prices). How much is a hotel in Manila for this weekend? The average price per night for a 3-star hotel in Manila this weekend is $104 or, for a 4-star hotel, $189. Looking for something even fancier? 5-star hotels in Manila for this weekend cost around $383 per night, on average (based on Booking.com prices). What are the best hotels in Manila near SM Mall of Asia? Some of the best hotels in Manila near SM Mall of Asia include Tiffany Room At Shell Residences, Conrad Manila and Reese @ Sea Residences Manila. Which hotels in Manila have nice views? Shangri-La at the Fort, Manila, Makati Shangri-La Manila, and Raffles Makati got great room view-related reviews from travelers in Manila. Which hotels in Manila are good for families? Many families visiting Manila loved staying at ZEN Premium Studio 89 QC, Citadines Bay City Manila, and Upper Story Serviced Apartments. On average, it costs $51 per night to book a 3-star hotel in Manila for tonight. You'll pay around $104 if you choose to stay in a 4-star hotel tonight, while a 5-star hotel in Manila will cost around $239, on average (based on Booking.com prices). 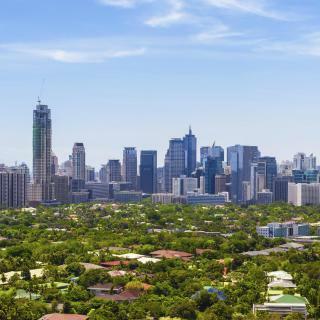 Which neighborhood is the best one to stay at in Manila? 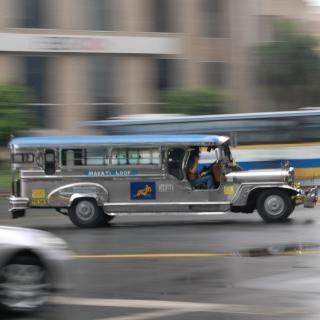 Pasig, Makati, and Pasay are popular with other travelers visiting Manila. 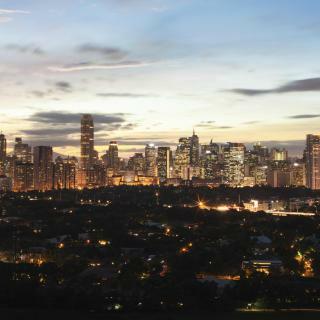 With a rich mix of influences from Indian, Chinese, Spanish and American cultures, Manila is the vibrant capital of the Philippines and its cultural and economic center. 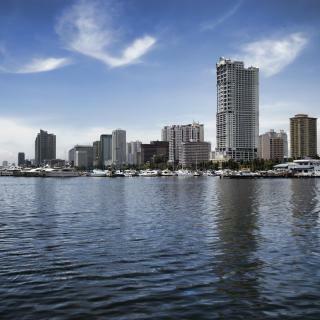 Thanks to the trade with Latin America during the three centuries of Spanish colonization, Manila became an important city, known as the "Pearl of the Orient." Don’t miss a visit to the Spanish remains in the Intramuros district. Important landmarks in the area are the Malacañan Palace, the City Hall, and the Manila Cathedral. Rizal Park is a national icon, while the Baywalk promenade is great for enjoying the well-known city sunsets. 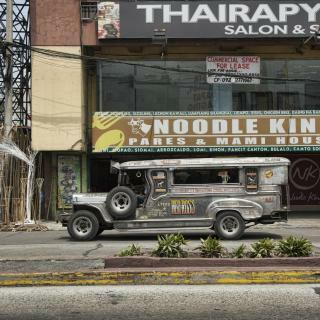 Ermita and Malate districts are famous for the nightlife, trendy shopping and restaurants, as well as for some luxury Manila hotels. Between the promenade and the districts, its easy to see why Filipinos call Manila “The City of Our Affections,” where the people's love affairs with fashion, music, entertainment and sheer fun are on bright and beautiful display. Divisoria is a traditional district for local shopping, bargains and typical food. Binondo is the oldest Chinatown in the world. For hotels in Manila near the airport, Ninoy Aquino International Airport is not far from Makati City. Amazing, bustling & wondrous metropolis! Amazing, bustling & wondrous metropolis! Stay by the Manila Bay / Mall of Asia area. This location has many resort options, dining, shopping, casinos & daily boat cruises to suit your fancy! I most liked the Spanish history visible at Intramuros and Chinatown. The parks, especially Rizal Park, were pleasant to wander with all the theme gardens. The museums there also are a must see. I got around town using Grab, which was very economical. I liked that Grab drivers and tour guides warned how to protect myself from scammers and potential thiefs. I did not like that there were sadly homeless people everywhere. It seemed every 10 meters there was someone lying on the ground with their meager possessions. Even in the park, next to family picnics and chess tournaments were homeless folk. Just be mentally prepared. Although you see a lot of buildings getting constructed, it’s sad to know that they’re not doing anything about the traffic. They’re not projecting the traffic once all the holtels and the casinos are done. You still see the streets are not wide enough to accommodate the vehicles especially in the reclaimed area where the development is. Walking the streets of Manila fills the nose with the scent of 1950’s cleansers, carbon monoxide and warm pants filled with urine. Walking is an art form unto itself more like a dance dodging an endless flow of overcrowded vehicles and pedestrians. There are endless girly bars and restaurants for every palate and taste. All in all Manila is an historic city filled with many centuries old cathedrals, forts and cultural exhibits. Manila's has it all but we satellite from Manila to near by islands like Coron, El Nido. Borocay, Palawan pick a few there are over 7000 lovely Islands. People are just fantastic where during Christmas time they go Caroling...something that has disappear from other cultures. I can go on and on We love it all Please go Island hopping and you will see clear clean ocean waters great for diving or snorkeling. I highly recommend a restaurant called Bon Chon it has really delicious chicken, and I recommend getting the Bing Su it is an ice cream dish that was absolutely fantastic! If you have internet service I highly recommend downloading the Grab application to get around. If you do not have internet service make sure you always run the meter in a taxi. 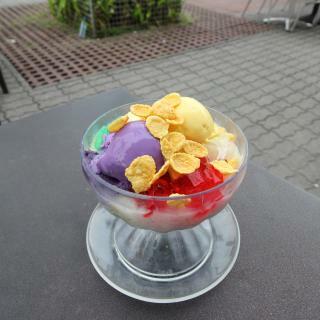 The Mall of Asia has some great food and shopping there. Very quiet in amidst of busy Manila streets. Very clean and all staff are very courteous, kind, understanding, caring and professional! Excellent customer service!! Hotel is beautiful and is 4 star hotel. Amenities are excellent except for some WiFi problems at one point. To sum it up this is a great find and it’s worth the value. Oh the Buffet breakfast was amazing, different kind of food from breakfast to dinner type. It's a big room for three adults. I am not a resident of Manila but needed our hotel to be near shops, restaurants, my son's school and my doctor (Makati Medical) since I was doing errands and appointments during our stay. As a person with disability and a local tourist, for the price of stay, it answered all my location and comfort concerns. Professional, timely and helpful staff service. English language fluency AND COMPREHENSION by hotel reception staff. Airport collection and drop off. Excellent array of foods at buffet breakfast. Beautiful and scenic view of Manila Bay from my room. 10 minute leisurely walk to Robinsons Mall in Malate. Excellent value for money. Exceptional spa facilities, old hotel but well maintained. It’s the only hotel I stay in besides the Shangri-la whenever I am in Manila. Sound proof rooms, blackout curtains and staff are courteous + professional. They met us a the airport with our luggage since we were going to miss our connecting flight to Mindanao. This is a gem of a small boutique hotel. It is not in the tourist area and a bit difficult for even the taxi drivers to find. The WiFi is excellent (for Manila). The bed is comfortable. The washrooms are ones you’d be happy to have at home. The staff is friendly. The staffs were super friendly and helpful, I enjoyed a lot there. Also the location was not that much far from the airport and good for a nightlife as well. Undoubtedly I will book in I’M hotel again when i come back to Manila. our trip was just for a night before flying to El Nido , this hotel has everything you might need for a night and it's especially good for being close to the airport to skip the manila traffic before flying ! Service. Comfort. Security. Location. The view from the rooftop bar and restaurant was spectacular. This was an affordable high quality hotel in the Makati district of Manila. Fantastic. Great hotel and very good food and service location is perfect . 20 min from the airport . In Makadi that is the quality part of Manila . Super ! VERY much for your pennie. Very hard even for many FIVE star hotels in Manila to beat Nichols. Just as good as Sofitel but at a tenth of the price. I always stay here whenever I have an early morning flight from Manila airport. One of the reasonably priced decent hotels near the airport. As a newly opened hotel the finish always good and the rooms were clean. Great location for the airport T3 and the area of Manila is nice. Near AIRPORT behind SAVOY HOTEL MANILA and near the Casino. Chech-in ans Check-out very easy. Only CASH Payment! gives a nice view of the manila bay sunset, very clean hotel and near to PICC. I like the comfort in your hotel.